Don’t get me wrong from the headline. I love National Geographic. I have received an issue every month of my entire life. But the reporter here, John Roach, made a critical mistake in his otherwise largely accurate report regarding Scott and Pinter’s work. 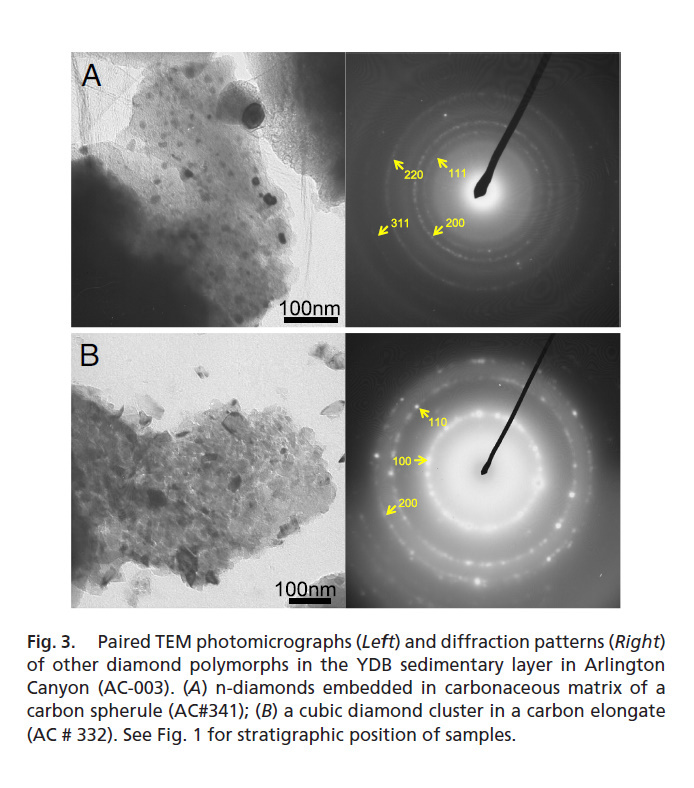 The Carbon Spherules (CS) are indeed found “alongside” the diamonds in the Younger Dryas Boundary. But, far more importantly, the CS themselves are chock-a-block-full of diamonds! That is an important distinction for the little buggers. The question — since the very first paper — has never been, “Where did the CS come from?” But rather, what the hell are diamonds doing in terrestrial Carbon Spherules? Pinter, Scott? Any thoughts? The shame is both on the bad science from Pinter and Scott, and the regrettable reporting. But it always seems to come down to the same thing: a willful (Pinter and Scott) or unwillful (NatGeo) misrepresentation of the claims made by the YDB group. Unlike some scientific theories that evolve and distance themselves from previous published claims, the YDB seems to invite the critics, reporters and the interested public to simply sit down and read all the papers, carefully (find a few here). If so the readers would note, among other things, that Pinter and Scott are in complete agreement with the YDB team regarding the potential for CS to be poop, fungi, or any other organic, terrestrial nit or nat. The questions then are: What filled the CS with tiny gems? And, secondarily, why would Pinter and Scott write a scientific paper and speak to the press as though they provided some type of damning contrary evidence, when clearly they had not? The Tusk will leave the first question to the credentialed scientists. The second will be subject to on-going speculation and investigation by the Tusk.